I won't lie to you. Having an arcade machine is a lot of fun. I used to have about 6 of them, but I'm down to two, due to space restrictions and general sanity. The two that I still have are a TRON Mini/Cabaret, and a generic full-size cabinet into which I can put one of a few game motherboards that I have. (Dig Dug, Mortal Kombat, Klax, Rampart, and a few others.) 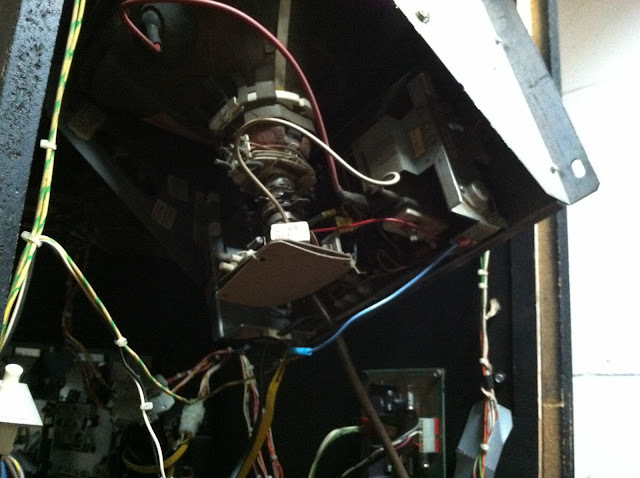 But one of the less glamorous sides of collecting machines is troubleshooting and repairing these 30 year old beasts. I bought the Tron Mini in the late 90s as an empty cabinet. I was having a difficult time back then finding an affordable Tron board/control set to install, so I instead put Satan's Hollow into it. 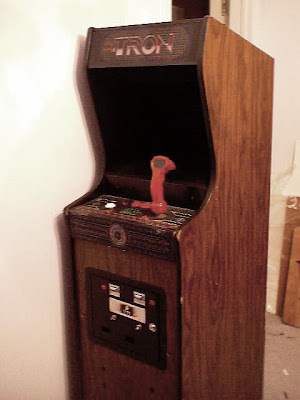 Tron Cabaret cabinet with Satan's Hollow - Note the red joystick and white "shield" button instead of the standard blue stick and spinner from Tron. Over time, I found all of the parts needed including a few tricks to restore this. When I put the Satan's Hollow boardset in, I rewired/hacked/brutalized the wiring in the cabinet to accommodate SH. 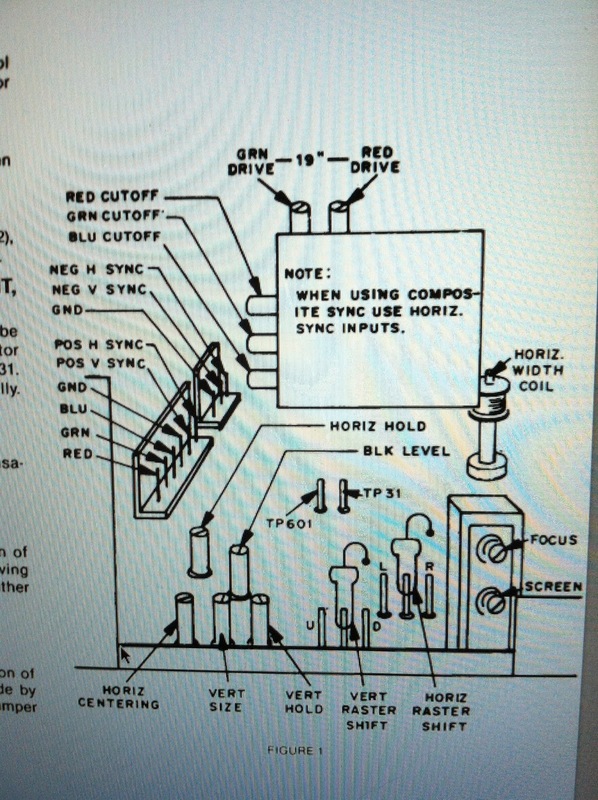 Although SH used the same boardset, the controls were wired differently. 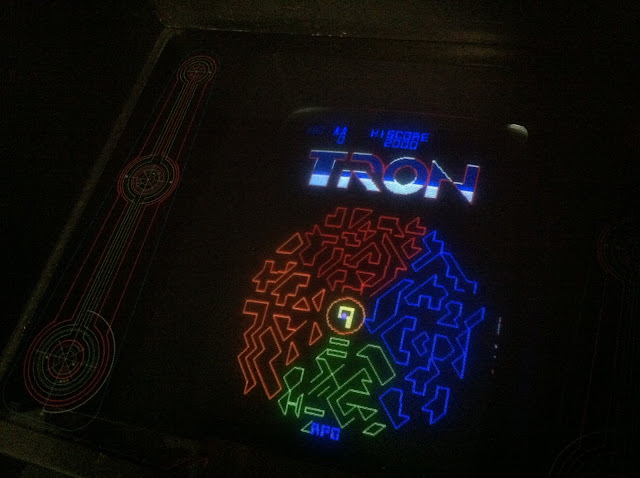 Once I got the Tron board, and realized how rare this machine really is, I re-wired it using a wire harness from a junked Tron machine. 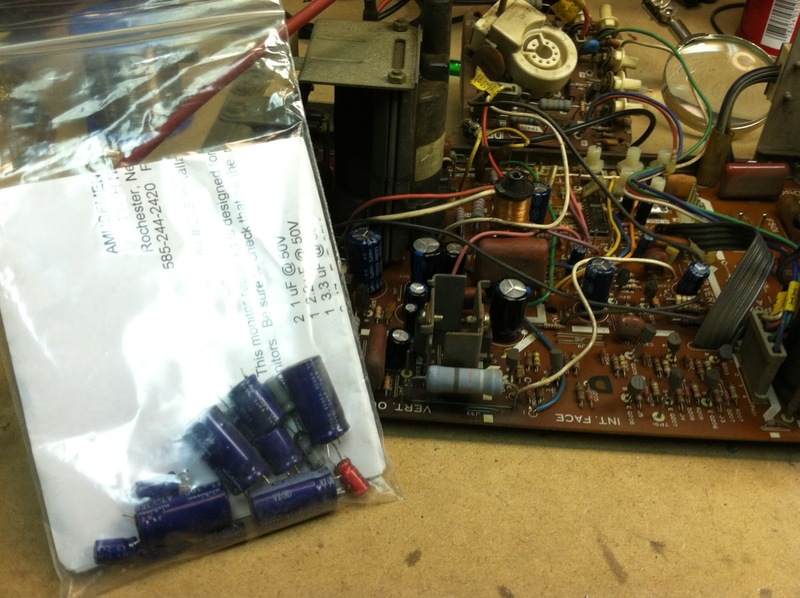 I also found the correct power supply to install, repaired by a fellow collector. The controls were also out of another junked machine. Over time, I got the machine as restored as I could get it. Tron uses a boardset, three boards connected together, from Bally/Midway called "MCR-2". It consists of a CPU/Program board, a Video/Graphics board, and a Sound/IO board. Midway used this boardset for a few games, including Tron, Satan's Hollow, Two Tigers, and a couple other ones. If you have a ROM programmer (which I do), you can buy one of the cheaper boardsets to use as a replacement for one of the more desirable machines. Tron boardsets, when I was last looking, sold for about $75-$150. Two Tigers sold for about $40. The boardset I have Tron running on right now is a Two Tigers boardset. When restoring a game, there's a line to walk with respect to what parts to put into it. This machine has some vinyl veneer on the sides, which are somewhat damaged. It also has a fair bit of wear on the front edge of the control panel. 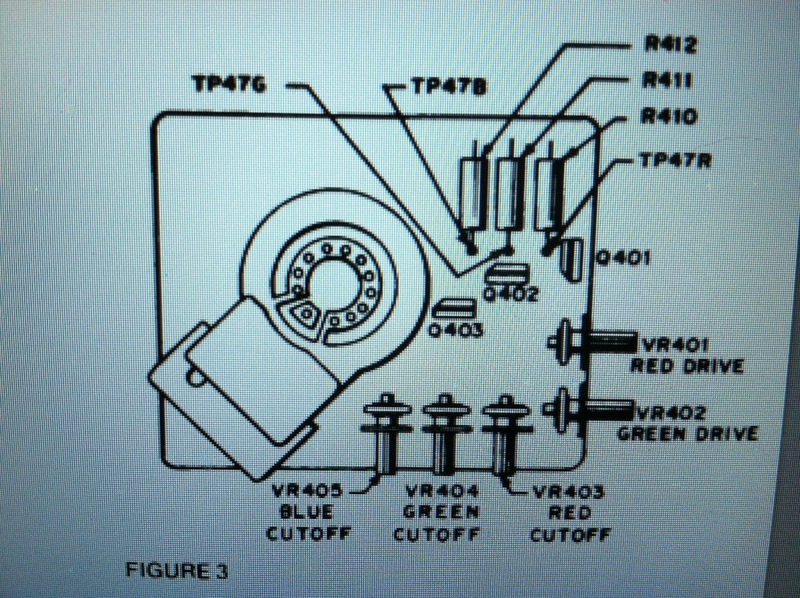 I could have tracked down a replacement/reproduction for these parts, but I'd rather keep it factory original. It's not like the damage is too severe for either issue. I'm actually very happy with the overall condition.... except for the monitor. 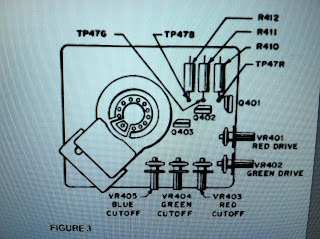 I was given a solution about 11 years ago, involving modifying one of the boards in the monitor (the "neck board", which connects directly to the back of the picture tube) but never did it, and lost the parts a few years ago. I instead bought a "cap kit" from Amusements Plus around 3 years ago, and decided to install it. The last time I did one of these was in 2001, so it's been some time. 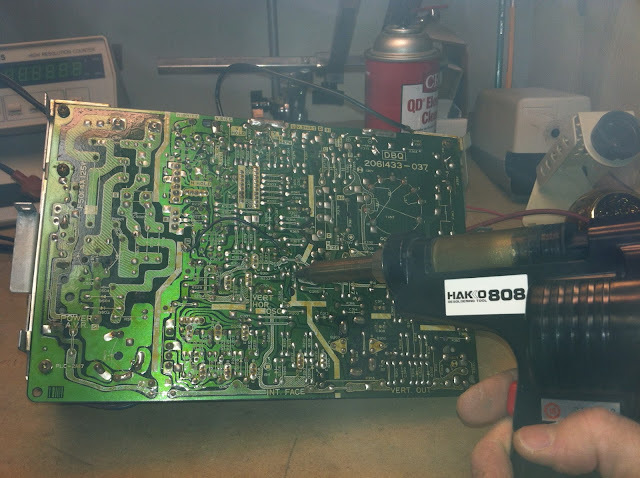 Love that desoldering iron! The pump just clears out all of the solder super fast! Thanks to the awesome desoldering tool at Interlock, I was able to do this in about 45 minutes, rather than the 3 hours it took me years ago. 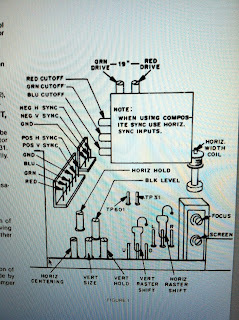 The board is mounted into the monitor framework, and reconnected to the picture tube. Just about all of these knobs needed to be tweaked to get the picture looking its best! After some calibration of adjusting all of the controls (focus and drive on the flyback transformer, and R/G/B Drive and Cutoffs on the neck board), the picture looked better than it has ever looked before! Which you can't really tell from these pictures, but trust me, the picture is sharp, colors bright, and the imagery is stable. It's like it's a new monitor! 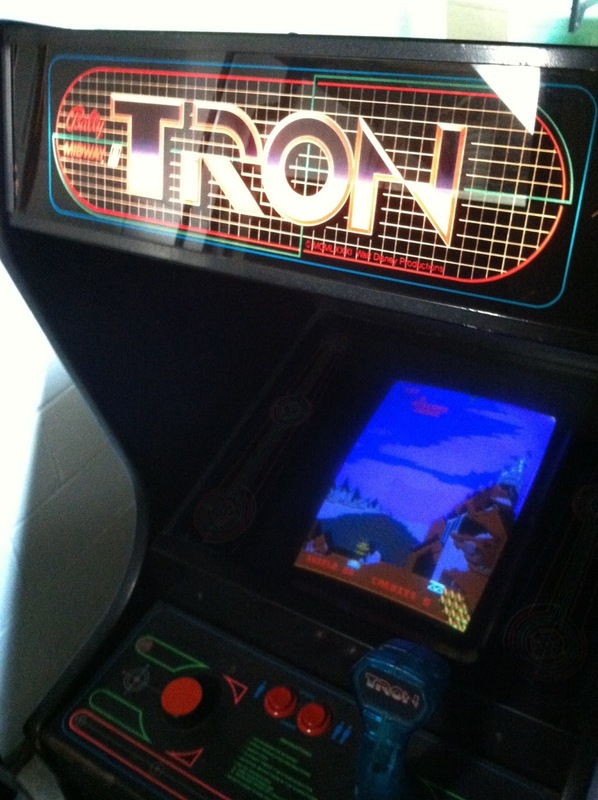 The boardset I had in it at first was the Satan's Hollow with my ROM hack so that it will work as a drop-in for TRON arcade cabinets with no rewiring at all. 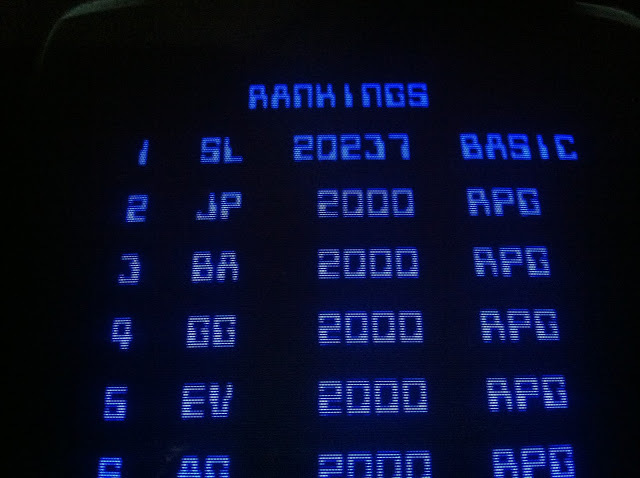 Yeah, a horrible high score, but just let me practice and remember my old strategies! The above pictures were taken before I realized how much dust had accumulated on the picture tube and shroud. I've since removed the artwork glass as well as the tinted plexi below that, and cleaned off those items as well as the picture tube itself. That eliminated all of the haze, and improved the picture as well! Hopefully, I'll get 30 more years of life out of if! Soon, I need to mount a bunch of UV LEDs in the cabinet to illuminate all of the art work. That's one of the features of the full-size cabinet that I really miss.